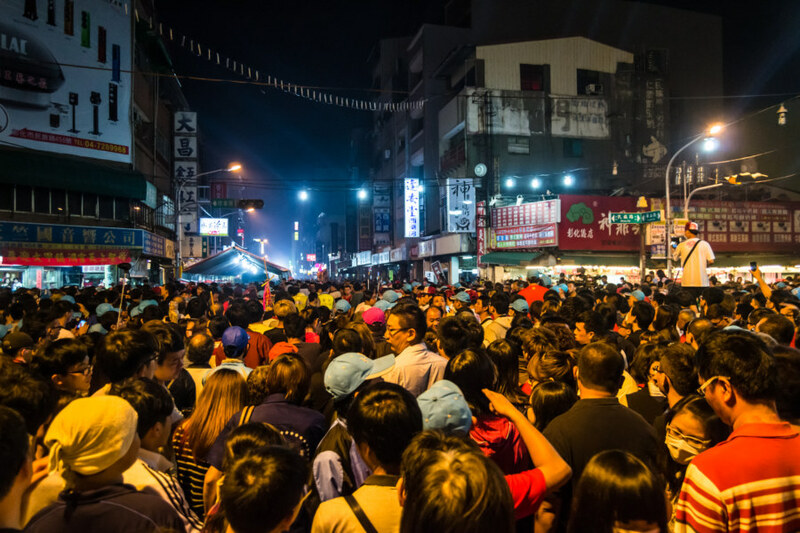 Yongle Street, one of Changhua City’s main shopping streets, six hours before the Mazu procession arrives. 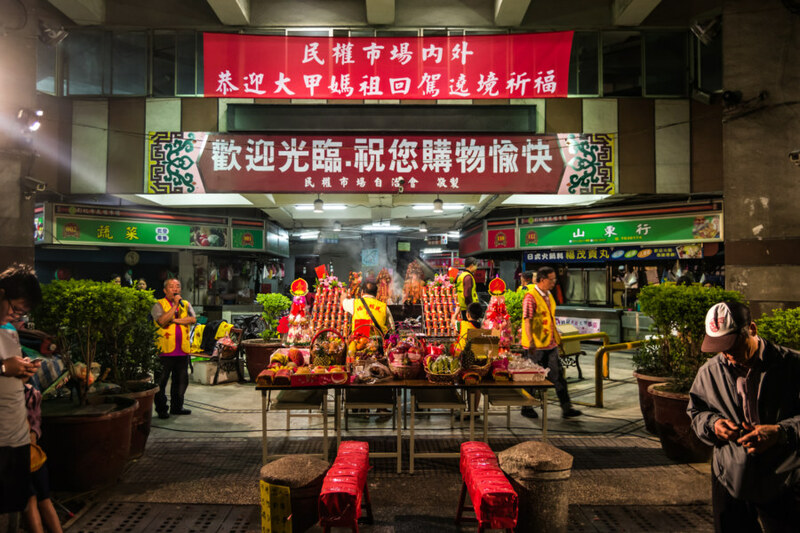 Ghost money vendor outside the main Mazu temple in Changhua City. This isn’t usually here. 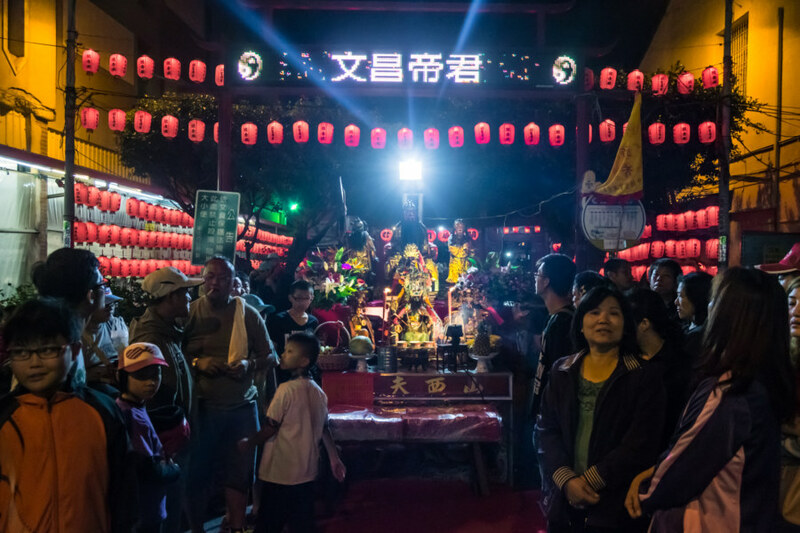 Mazu is easily the most popular deity in Taiwan and the Dajia Holy Mazu Pilgrimage 大甲媽祖繞境, which passes through Changhua 彰化, is one of the biggest (if not the biggest) religious festivals in the nation. I was aware it was going on but had missed the first pass (through the city from north to south) while in Hong Kong 香港 the previous weekend. 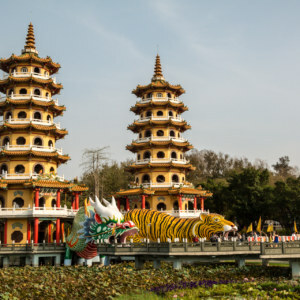 Somehow it hadn’t occurred to me to look up the timing of the return trip—when the pilgrimage makes its way back from Chiayi 嘉義1 to Zhènlán Temple 鎮瀾宮 in Dajia. Waiting for Mazu at the main Mazu temple in Changhua City. This is about six hours before arrival. 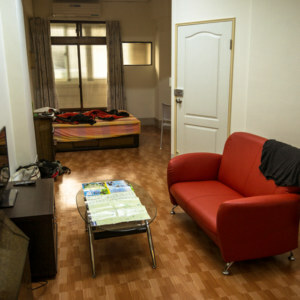 I had to wake up early the next day to meet my landlord so I didn’t have as much time to roam around as I would have liked. 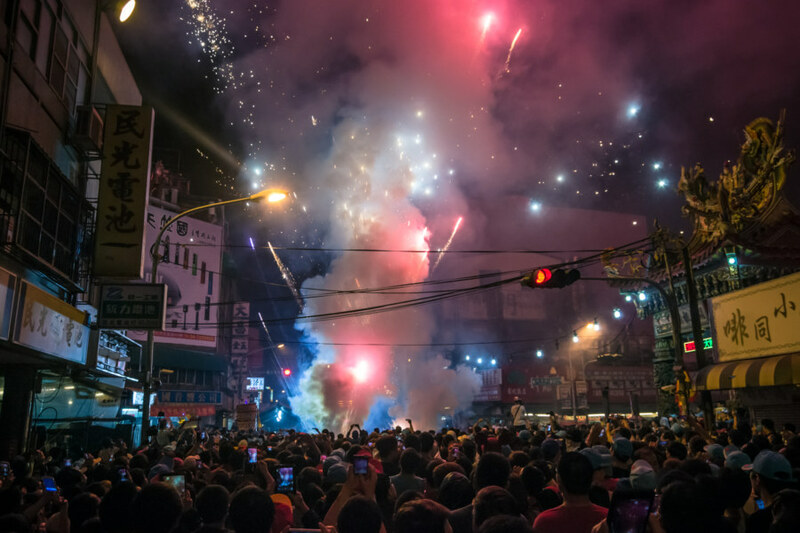 Even so, I still spent a couple of hours on the streets, reveling in the atmosphere and occasionally shooting some photos while doing my best to not get caught up in an unruly mob. 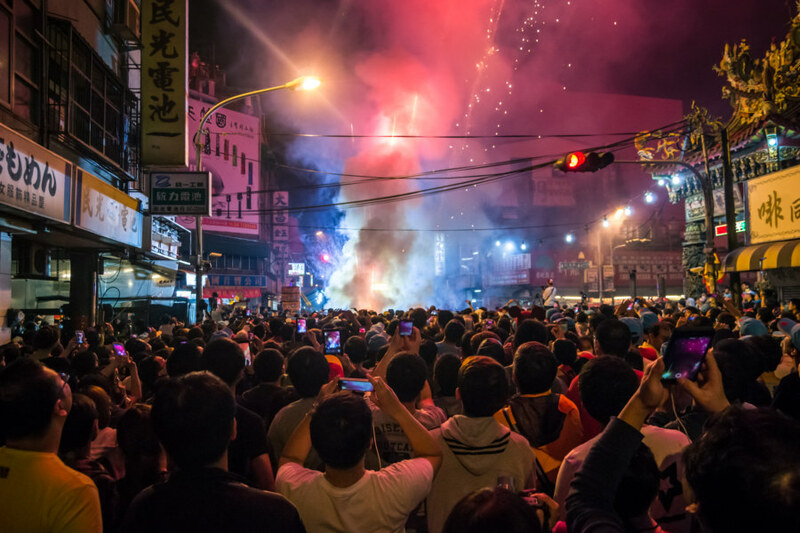 The last time Mazu passed through Changhua City a brawl had broken out on the streets. 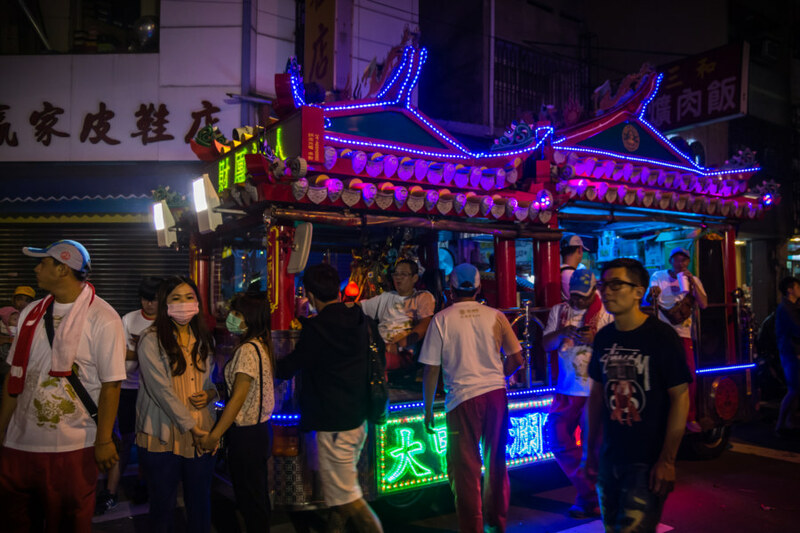 It is considered good luck to touch Mazu’s palanquin and people have been known to get a little overenthusiastic about it. 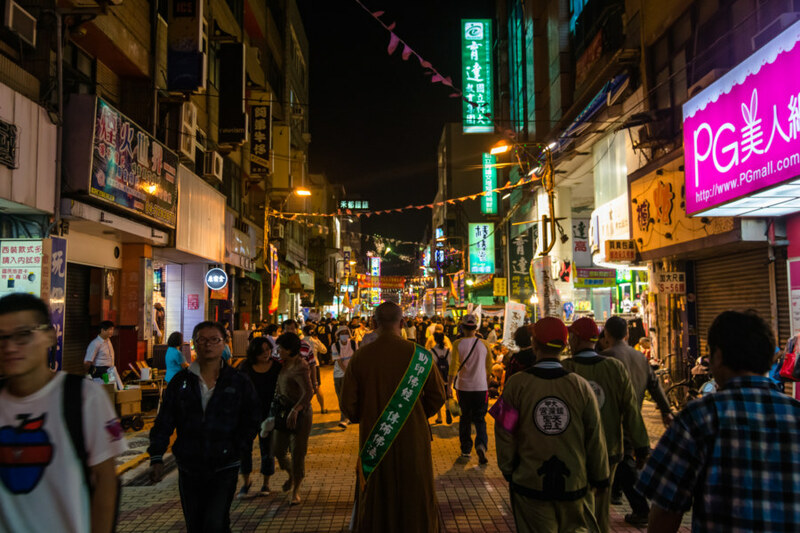 Monks at the end of Yongle Street. 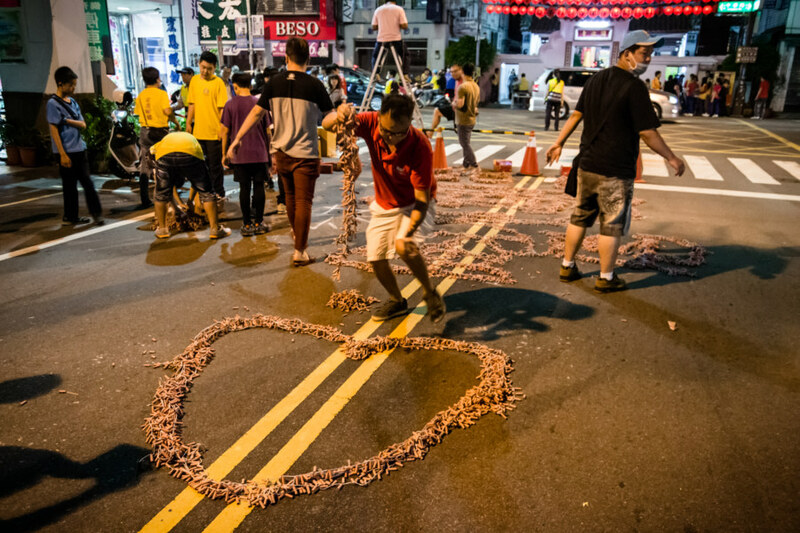 It’s a bit hard to see but these guys made a picture of Mazu out of firecrackers with a heart below. Helpfully they had someone with a stepladder setup near by to capture a better photo than this. 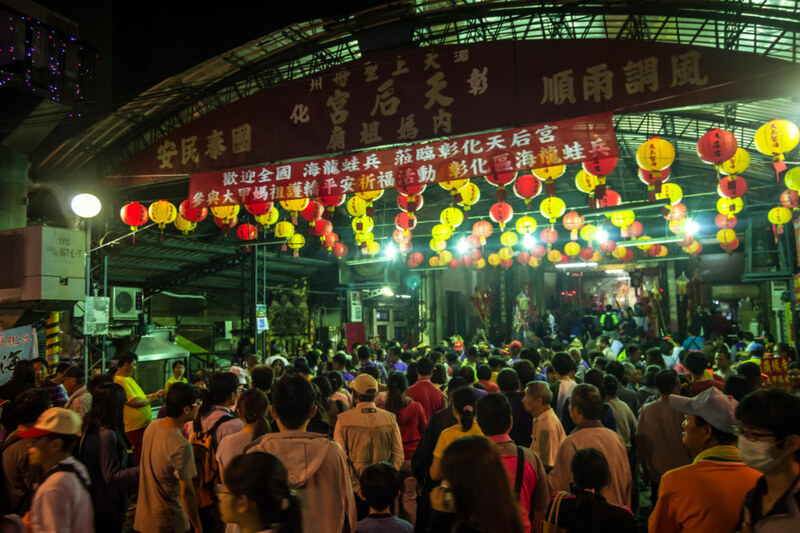 Temple events in central and southern Taiwan attract an interesting mix of characters. There are lots of old people, of course, as well as some regular family types, but also a lot of punk kids swaggering around with cheeks full of betel nut, recklessly riding scooters through crowds of people, hanging outside convenience stores and smoking cigarettes in little posses, and generally acting cool. Many of these same guys will act as palanquin-bearers or lay firecrackers for temple events. A glowing temple car. The dashboard was covered with bottles of what I would presume is alcohol. 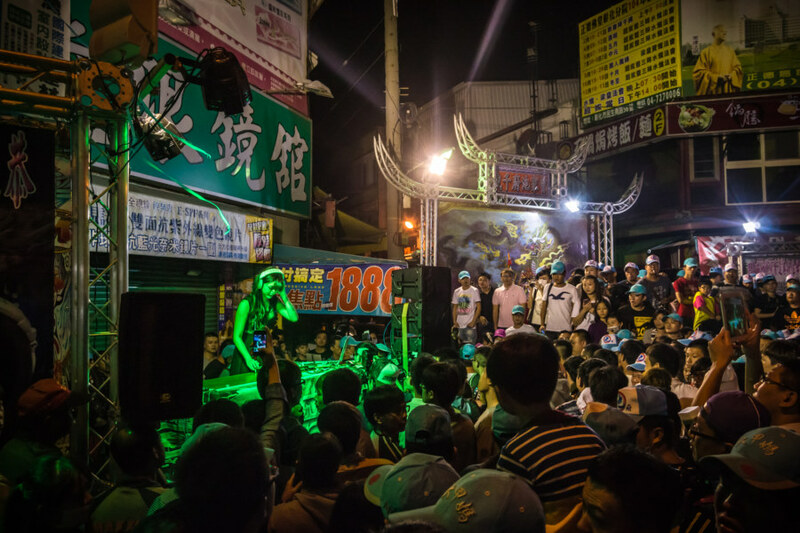 People like to get toasted at temple events in Taiwan and nobody’s driving fast enough for it to matter much. 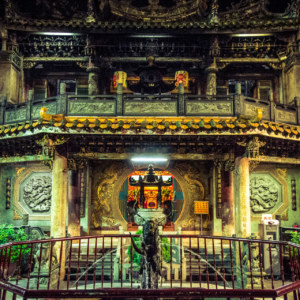 My understanding is that troubled youth often fall in with religion in Taiwan, much like what happens in Monga, a Taiwanese coming-of-age film set in the 1980s that focuses on a gang of young toughs based out of a temple in Wànhuá District 萬華區. 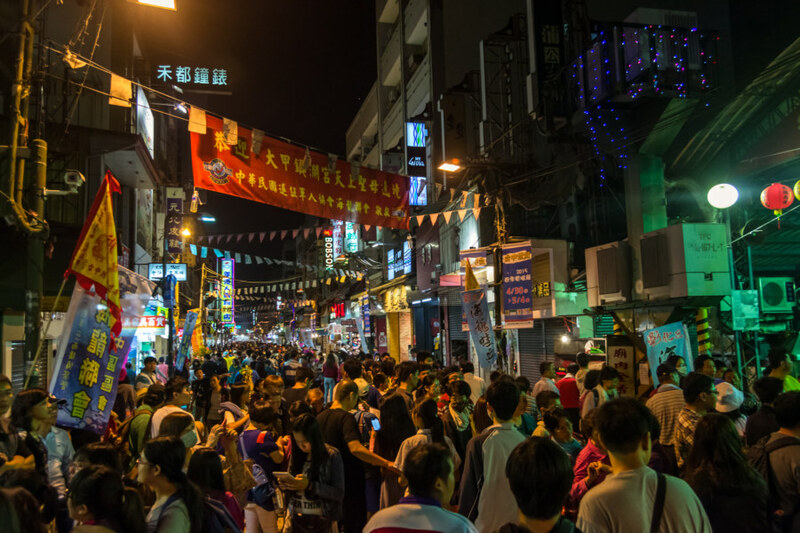 On big nights like this I always see lots of young people affecting a fashion sense and personal style generally known as táikè 台客, a formerly pejorative term that has been repurposed to express an authentic Taiwanese identity. I’m no expert in this kind of thing but it might be comparable to zef in South Africa, unabashedly hyper-local, low-class, and proud of it2. 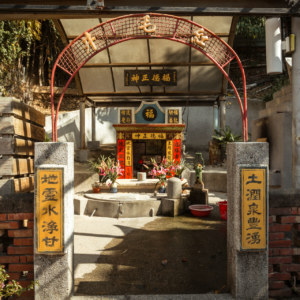 An offering in front of the Guandi Temple 關帝廟 in Changhua City. 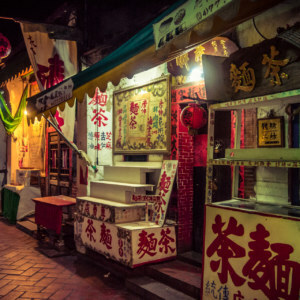 Minquan Market 民權市場 offering table. They were whipping up free dumplings and offering drinks for anyone passing by. 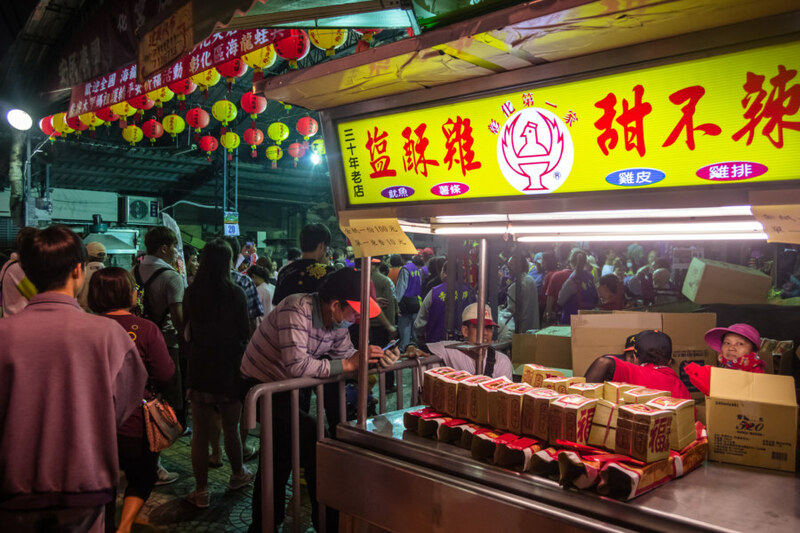 One thing the holy Mazu pilgrimage is known for is free food and drink. In my brief walkabout I saw many different businesses handing out dumplings and the like. I rather wish I had stopped for some but was caught up in trying to find a halfway decent perch to watch the procession pass. 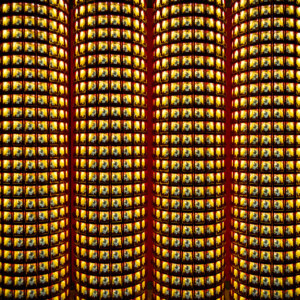 This wasn’t easy as tens of thousands of other people has the same general idea. 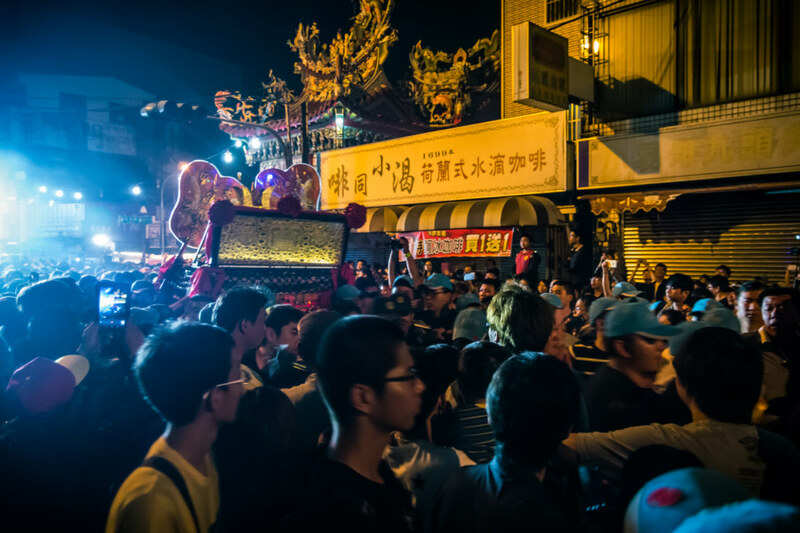 If I’m not mistaken Changhua City is the biggest settlement the procession passes through—so it probably doesn’t get any crazier except at both ends of the pilgrimage. An incredible crowd gathers to welcome Mazu. Eventually I found a spot by getting ahead of the process and then working my way backwards along its path through the crowd. As luck would have it I ended up not far from Kāizhāngzǔ Temple 開彰祖廟, the tiny nub of a historic temple at the former location of the city’s southern gate. 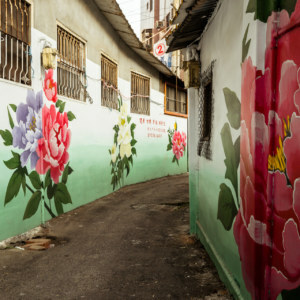 Changhua City’s walls were dismantled in the Japanese colonial era and several historic temples were partly demolished or even bisected to make way for road widening measures and the like. 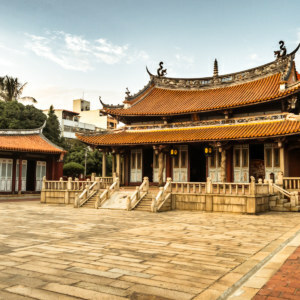 As such, you can’t judge the importance of a Changhua City temple by its size or appearance. There are several temples with absolutely huge followings and considerable influence that don’t look like much at all. Kicking off the half hour fireworks show in front of Kaizhangzu Temple 開彰祖廟. I don’t really know where Kaizhangzu Temple fits into all of this as the Chinese language articles I dug up didn’t make a lot of sense to me (even with machine translation). 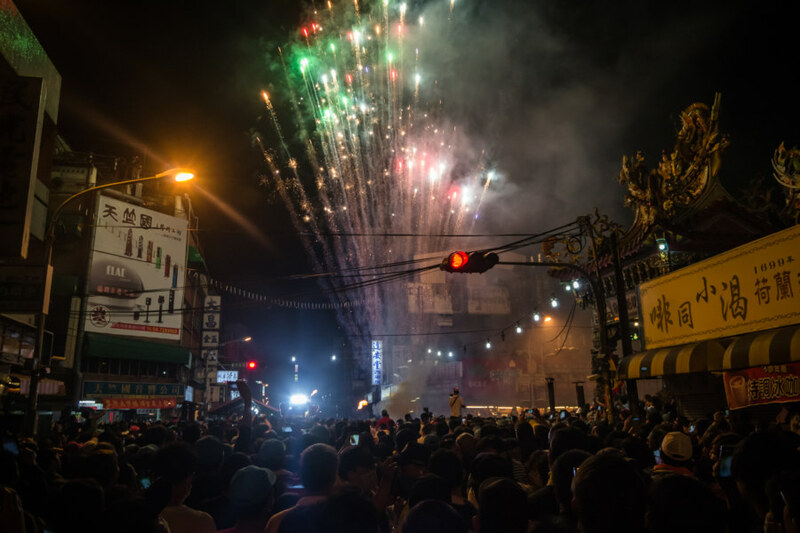 Whatever the case, this temple made an enormous investment in fireworks to delay the procession. The way this works, insofar as I understand it, is that the procession stops at various temples to charge them up with Mazu energy. The longer the procession stops the more energy a temple will receive. And how do you make the procession stop? Blow things up! 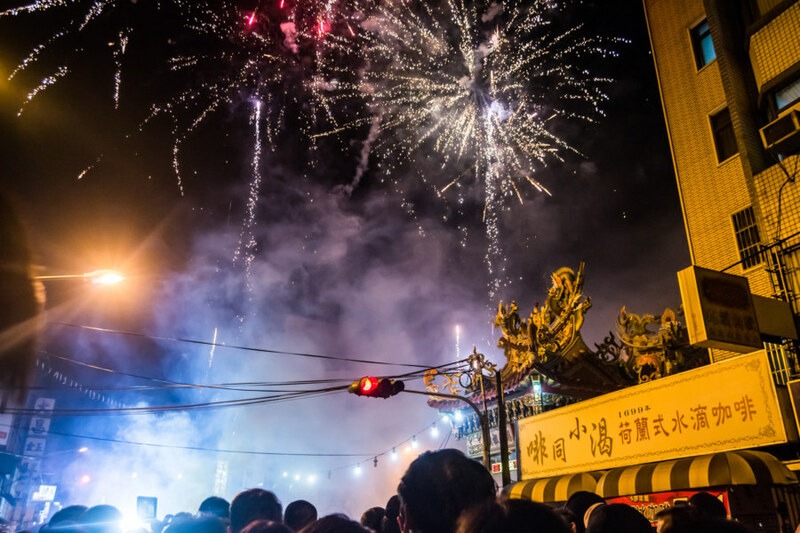 The gods of Taiwan love for things to be rènào 熱鬧, a term that literally means “hot and noisy”, and translates to “lively”. In real-world terms this means big crowds, lots of hustle and bustle, deafening noises, and plenty of things that go boom. And so the various temples blow up as many things as they can for as long as they can to accrue maximum spiritual brownie points. More fireworks means more Mazu. The longer the show the more luck this temple will receive. The fireworks show in front of Kaizhangzu Temple had all the subtlety of a brick to the face. It was absolutely epic in length, tearing a hole in the sky for a good half hour or so, but Symphony of Fire it was not. It was, in fact, hilariously monotonous, a ceaseless barrage on the senses that left us all halfway deaf and blind and without much of a sense of smell. I may as well have smoked a pack of cigarettes for all the toxic fumes I must have inhaled while wondering when it would end. The big guns come out for Mazu. Things really started to heat up at the 25 minute mark. 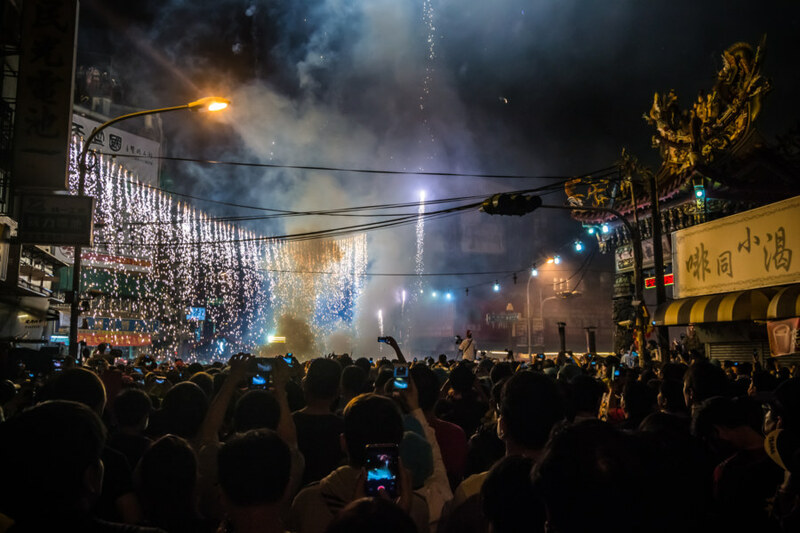 After a curtain of fire rained down on the crowd around the intersection the temple brought out the big guns—some kind of crazy fireworks cannon that swept back and forth launching volleys of explosives into the sky, put-put-put. Many of these blasts swept close to the many people watching the show on the rooftops surrounding the intersection. The show goes on… and on… and on. One thing I don’t really understand about Taiwan is how blasé everyone seems about this sort of thing. I kept expecting to hear a cheer go up when the fireworks ended but there was no sound, no clapping, nothing to mark the passage from one phase to the next. 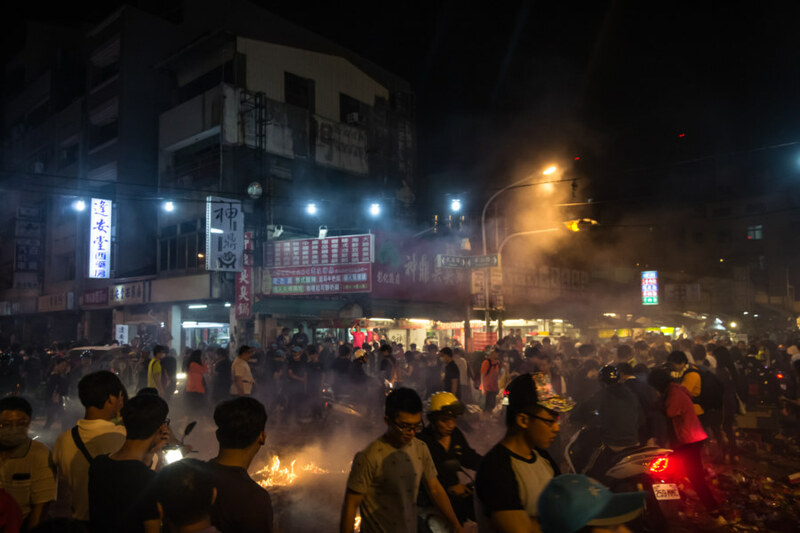 The inordinately bright light on the truck behind Mazu’s palanquin, heretofore hidden in the cloud of smoke in the middle of the intersection, began to creep forward, and the crowd began to move—slowly, at first, and then violently. Finally we’re on the move again. I have about a second to snap a quick picture of Mazu’s palanquin as the crowd surges forward. I was not inclined to risk getting trampled simply for the privilege of snapping a good photo up close so I pressed myself against the back of a parked car and did my best to withstand the onrushing human torrent. The photo I managed to capture is blurry as hell but in a way that’s a fairly representative of the experience. People were absolutely mad for it, screaming in desperation when the palanquin passed just out of reach, pushing and shoving to break through the crowd for their chance to touch the divine. Half an hour of fireworks left nothing more than a smoldering crater and a hell of a lot of smoke in the air. Walking back to my bicycle I heard some mainstream electronic music up ahead. Lo and behold, a local DJ was rocking. I wandered back up Mínzú Road 民族路 to where I had parked my bicycle, crossing my fingers that it hadn’t been subsumed by a sea of scooters outside Kāihuà Temple 開化寺, making a brief stop to pick up some fresh watermelon juice. Along the way I witnessed another curiously Taiwanese phenomena: a DJ blasting out EDM tunes on the street to a completely still audience. People here don’t seem to know how to dance—or even that they should be dancing—so the usual thing is for people to stand around like a bunch of stiffs and take photos. You see the same thing at local nightclubs where the DJs and dancers on stage are a commodity to be consumed and perhaps documented, not an experience to participate in by dancing. So why bother having a DJ at all? To answer that all you need to do is return to first principles: the gods like it hot and noisy. DJs (particularly attractive female DJs) playing EDM are exactly that. 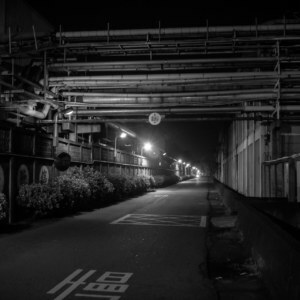 Last night on the streets of Changhua City. 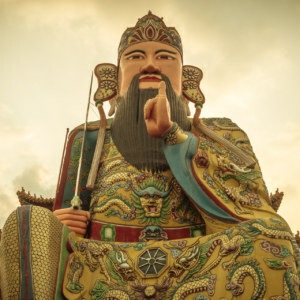 I would have loved to stay out to see what else might happen, particularly when Mazu arrived at her destination for the night—the main Mazu temple in town—but I had to turn in. I really couldn’t have asked for a better last night in Changhua City. 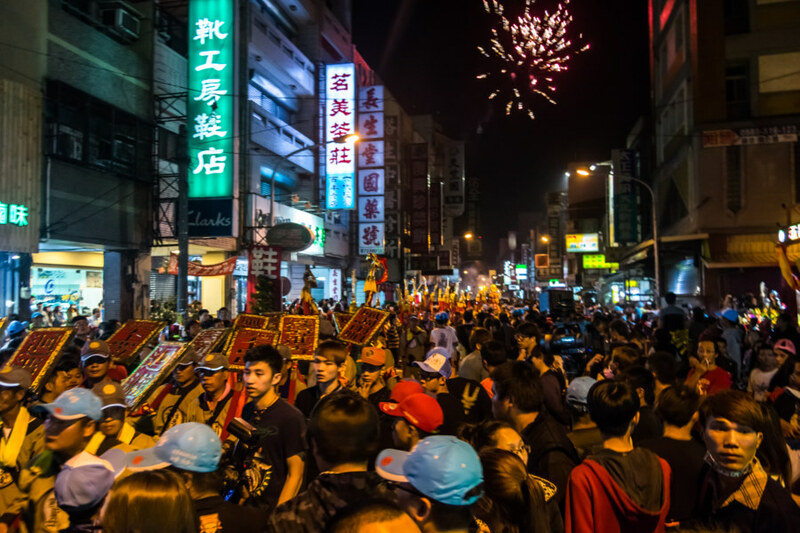 I have not always enjoyed living here this winter—but experiences like this remind me of how much fun it can be when you take to the streets and get caught up in the wild side of Taiwanese culture. 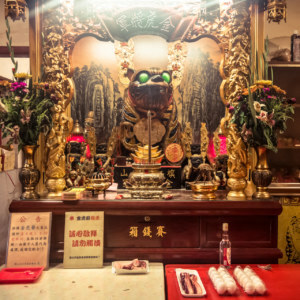 At any rate, I hope this little window into a brief few hours of this nine-day Mazu odyssey stoked your interest in the subject! 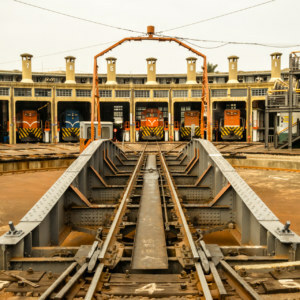 Markdown and basic HTML is allowed in the comments.